Visual Business Intelligence – What can the Wall Street Journal teach us about information graphics? What can the Wall Street Journal teach us about information graphics? 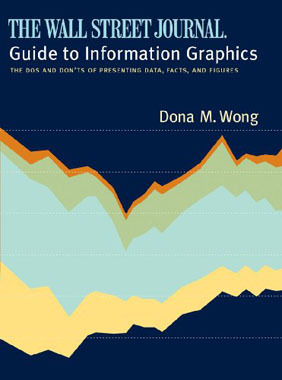 A new book about information graphics was published last month titled The Wall Street Journal Guide to Information Graphics, by Dona M. Wong, the graphics director for this respected newspaper. I get excited whenever a new book about data visualization is published, especially one that teaches practical techniques, because too few of us are working in this field. This new addition to my library has its merits, but unfortunately it has its problems as well. To begin, this book is not what its advertising claims it to be. Rather than “the definitive guide to the graphic presentation of information” and “an invaluable reference work for students and professionals in all fields,” which the dust cover claims, it would be more accurately described as a graphical style guide for financial journalism. I suspect that the content of this book was in fact written by Wong originally as the graphics style guide that is used internally at The Wall Street Journal, and that the newspaper envisioned a new source of revenue by revising it slightly and publishing it as a book. There’s certainly nothing wrong with that, but they should have more clearly described its scope as restricted primarily to the interests of financial journalism. The quality of this book that will no doubt appeal to many potential readers is, in my opinion, its fundamental failure: it includes relatively few words. Unlike her mentor, Edward Tufte, who uses words liberally and eloquently, Wong’s style of writing is closer to the bullet point approach that Tufte disdains. In this respect, it is different from my books, which have at times been criticized for having too many words. A few readers have remarked that I don’t follow my own principle of simplicity in my books because I use too many words to present the material. What they don’t appreciate is the important difference between simplicity and over-simplification. I provide the context that people need to understand what I teach. When you tell people what they should and shouldn’t do without explaining why, they can at best learn only superficially. To learn deeply, people must understand things at a conceptual level-why things work as they do. This requires more than a few words. Wong’s book has too few. In total, the book includes 120 pages of actual content, which consists mostly of figures. The fact that so many figures exist is not the problem; it is in failing to explain her recommendations that she errs. She says “Do this and don’t do that,” but rarely helps her readers understand why. One problem with this is that Wong isn’t always right, but people who are learning about information graphics for the first time won’t realize this. “Do not plot more than four lines on a simple [line] chart.” (p. 54) Rule of thumb with many exceptions. Depending on the nature of the data (for example, how close the lines are in value and how much variability in values exists along the lines), a graph could contain many more than four lines and still work quite well. Also, when line graphs are used, not for comparing individual lines, but to provide an overview in a way that features exceptions and predominant patterns, far more than four lines can be included. “Don’t use different colors or colors on the opposite side of the color wheel in a multiple-bar chart.” (p. 40) It depends. Different hues work best for differentiating items, which is what’s usually needed in line graphs with multiple lines, bar graphs with multiple sets of bars, and so on. “Choose the y-axis scale so that the height of the fever line occupies roughly two-thirds of the chart area.” (p. 51) Ineffective rule. I think what Wong’s trying to do is bank the line to 45° so it’s not so flat that the trend and pattern can’t be seen, but this approach won’t guarantee this result. Setting the y-axis scale to begin just a little below the lowest value and end just a little above the highest value makes better use of the plot area. Once this is done, the aspect ratio of the graph (the ratio of its width to its height) can be adjusted to prevent the slope of the line from being either too shallow or too steep. “A segmented bar chart in general is more effective than a pie chart at showing proportions of a whole.” (p. 79) Not true. Actually, for showing a single part-to-whole relationship, a segmented (a.k.a., stacked) bar is never more effective than a pie chart, and in my opinion, neither works as well as a standard bar graph. 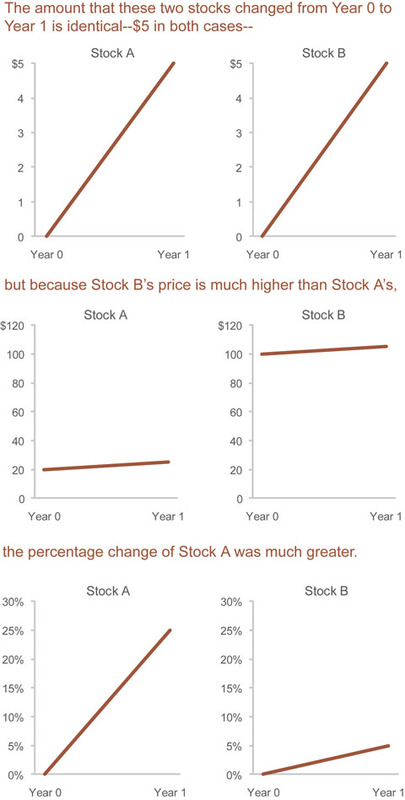 “Always label the value of a vertical bar if it is close to zero.” It depends on how the graph is used. Labeling these values is only useful when people need precise values, and why would this rule apply to vertical bars and not to horizontal bars? When it is appropriate to use different color intensities to differentiate series of bars in a bar graph, Wong states: “The shading of the bars should move from the lightest to the darkest for easy comparison.” (p. 67) Huh? Why not ever from the darkest to the lightest bars? 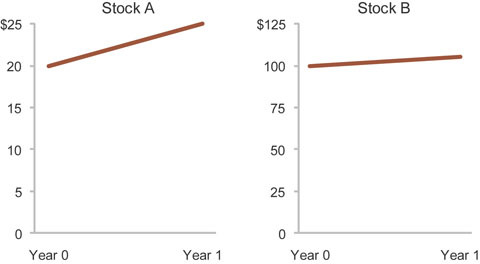 “When plotting horizontal bars over time, the bars should be ordered from the most recent data point [at the bottom] and go back in time [proceeding upward].” (p. 71) Don’t do this. I recommend that horizontal bars never be used for time-series data, because it is much more natural for people to think of time as proceeding horizontally from left to right. This is just a sample of the problems that I noted. Another point on which Wong and I definitely disagree has to do with her recommendations for making the quantitative scales of multiple line graphs different in an effort to make them more comparable, which she addresses in four different sections of the book. 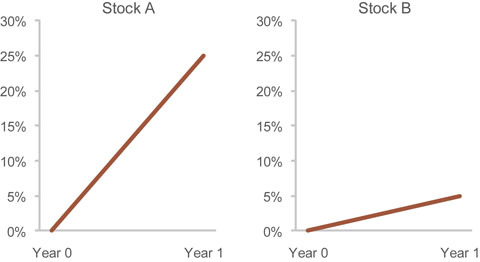 In one instance, she wants to make sure that people don’t miss the fact that the following two stocks increased at much different rates, which might occur if they were shown the following graph. Her solution is to show the following graph instead. Although I share Wong’s concern, her solution is misleading. To feature the differences in percentage change, the same percentage scale could be used for both graphs, as shown below. The best solution, however, unless the differences in the magnitudes of change really don’t matter, would be to tell a richer story by presenting the following collection of graphs. Given the fact that Wong studied under Tufte’s supervision at Yale, I expected to find little with which I would disagree. I was surprised to discover otherwise. Despite our disagreements, I agree with most of Wong’s suggestions, but in almost all such cases she restates what I and others have said before. If you’re already an expert in data visualization, you’ll learn little from this book, except a few techniques that are specific to financial journalism. If you’re a novice hoping to learn the fundamentals of information graphics, be warned that this book advocates a few bad practices along with the good, and it rarely explains the concepts that you must understand to produce effective graphs on your own. The last example: as space is at a premium in newspapers, your solution of graph collection telling a story is just not doable in publishing context as it just takes too much space. 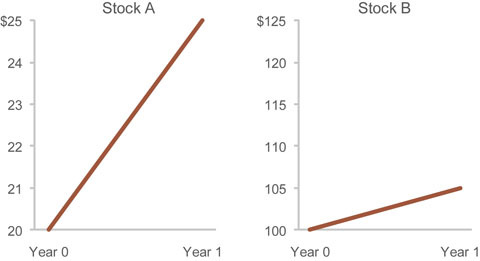 What about using the absolute scale in $, which is normalized to cover the same percantage in both cases, say 0-25$ for stock A and 0-125$ for stock B? Do you believe that it tells the story as clearly? What do others think? As a satisfied purchaser of your books, let me say don’t skimp on the words and sentences! No, I don’t believe that your example tells a clear story. 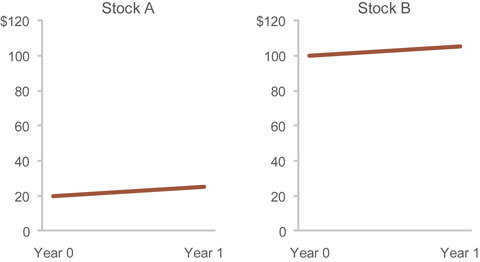 The casual reader will assume that Stock A is worth more than Stock B. I think your proposal in the original post to compare growth rates does a more effective job of telling the story. I also agree with derek’s comment. Rules will always have exceptions, but they are necessary in order to maintain consistency. While your books and Tufte’s focus on the theory and reasoning about why you should use a particular technique in one case or another, Wong lays down a framework for an operational team. I consider Wong’s book to be the equivalent of the AP style guide for charts. Declaring a set of rules without explanation doesn’t work unless people already understand the material, even in a style guide, and it certainly doesn’t work in a book that claims to teach people a set of principles for graphical communication. Following a set of rules is not a substitute for understanding. Practical skills can be taught with explanations for how and why things work without getting bogged down in theory. Had Wong tried to explain the principles that she teaches, she might have discovered that a few of them actually don’t make sense, resulting in a better book. I usually agree with your criticisms of data visualizations, and I mostly share your aesthetic. However, you focus so tightly on the flaws in this work that you obscure its possible strengths. You mention that “this new addition to [our] library has its merits”, but you enumerate none of them. As a consequence, I cannot tell whether this book might be worth buying despite its problems. The review is less useful to me than it might be. My critique of Dona Wong’s new book was harsh, but accurate. You pointed out that I didn’t enumerate any of the merits of her book. The merits that I alluded to but didn’t enumerate include most of the guidelines that she proposed, which are aligned with best practices. Although these guidelines are good, she didn’t explain them, however, which assumes that her readers only need a list of rules to blindly follow, rather than an opportunity to learn how and why they work. Without this level of understanding, her readers won’t be able to apply the rules knowledgeably and flexibly. They also won’t recognize the many exceptions that exist to many of her rules. I didn’t enumerate her viable guidelines because it really isn’t necessary to dwell on graph design principles that I, Tufte, and many others have written about at length before in more enlightening ways. Because I cannot recommend Wong’s book to my readers, I used my blog to explain why, which led me to feature examples of the book’s failure. Even though the useful guidelines in Wong’s book are not new, had she presented them in new and useful ways that might have extended a readers’ understanding, I would have congratulated her for this and shown examples. My own book “Show Me the Numbers” introduced very little about graph design that involved new principles, but instead pulled together the work of many others into a single book and expressed the information in a comprehensive, accessible, and practical way that no one had ever done before. I did this because it was needed. In contrast, I don’t believe that Wong’s book offers anything new, with one exception, which I failed to mention in my blog. She presents a few fairly unfamiliar guidelines that specifically apply to financial infographics, which financial journalists might find useful. Rather than wading through an entire book of mostly repetitive guidelines to find these nuggets, I would have preferred a brief monograph that focused exclusively on them. That would have saved me and others time, and perhaps money as well. I hope I’ve clarified my position for you a little. Well, I’ve actually bought the book as it’s rare to see anything on the subject. Already being familiar with your work, and an owenr of microcharts, and Charles Kyd’s ebook, I didn’t much need an explanation of the theory. As such, the book makes a good, get to the point, reference for some. I think the cookbook analogy is appropriate. You don’t learn to cook by just following recipes. The same is true of graphical communication. And unfortunately, some of the recipes in Wong’s book produce inedible dishes. In general, I object to books and courses on almost any subject that state rules without providing explanations and without engaging people’s brains at the level of understanding. As a teacher–someone who cares deeply about helping people develop real skills–I’m concerned that the cookbook approach to teaching is producing an intellectually impoverished populace. People rarely remember and continue to follow rules that they don’t understand. Graphical communication is a skill that can’t be taught in cookbook fashion. The American workforce is losing its edge in the world, in part because people are substituting the development of expertise with the acquisition of superficial rules and procedures. I have not read Donna Wong’s book, but based on my readings of the Wall Street Journal, I do not think I would purchase her book as a reference for building effective graphical presentations. As a reader of the WSJ, I miss the easy on the eye; informative well-written paper published pre-Murdoch. Now, we have this busy, busy paper with black & white pictures on this page, colored pictures on the next, black & white graphs, colored graphs, and objects that appear to be graphs but I am not sure. Today, one article that caught my eye occupied 96 sq inches of print space. The article devoted 7 percent of the print space to headlines, 18 percent to photos, and 22 per cent was one of those objects that appeared to be a graph. By adding in a little white space then approximately 50% of print space was other than print. I have not figured out what information the object was attempting to present. There was also a bubbly chart on Marketplace with arrows and bubbles of many colors and sizes going different directions. Apparently, 1,000 executives were interviewed for the champagne presentation. I used to save charts and figures from the Journal as examples, and then I saved charts as examples of “what the heck kind of chart is this”, and now I don’t save those anymore because they seem to show up on a regular basis. I think it’s good for one particular audience, and that is for the non-visualization types who earn their living every day creating charts in tools like Cognos, Microstrategy, etc. I’m talking about the people who are too lazy to read your books or Edward Tufte books, because, well, what they do is just a job for which they have no passion at all. Even by following some of the more flawed advice in this book, these people who I refer to would still produce better visualizations than they do today. The “quick hit”, “black and white” approach of the book makes it easier for them to at least have a minimal set of standards. I’ll leave the word “minimal” as subject to interpretation. Ideally, the people who do read Wong’s book would become more interested in visualization and start reading more substantive materials like your own and Tufte’s work. Did someone mention cookbooks? I love cookbooks! Some of my best friends are cookbooks! But I avoid those that simply spell out the recipe with no background on why the recipe works, or how many versions were tried before the final version was put on the table. All that background makes the final product richer in my view. I enjoy the suspense of creeping up on the solution. It sounds like the WS book is kind of like the recipe books I generally don’t like, but use once in a while if I’ve already made the thing before and need a quick reminder or two. I have no problem with sentences, paragraphs, or even pages of background, context, and just plain conversation that helps to build a deeper understanding of why things work. Pie or no pie, it’s all good.